How does one drive a 340-ton boulder into Los Angeles? A very large boulder is on its way to Los Angeles, we read in the New York Times this morning: a 340-ton rock on a journey moving "through the heart of one of the most congested urban centers in the country: nine nights at six miles an hour, through 120 miles of roads, highways, bridges, overpasses, overhead wires, alarmingly low-hanging traffic lights and sharp turns." 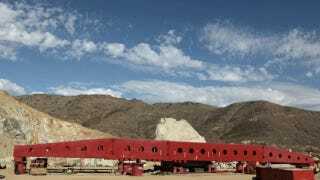 The rock is going there for an installation by artist Michael Heizer, called "Levitated Mass," and it was "dynamited out of a hillside" 60 miles from Los Angeles. "The effort, nearly five years in the planning (though Mr. Heizer has been making sketches of it as far back as the late 1960s), feels nothing short of a military movement: an incursion through a bewildering thicket of state, city and county regulations and a region with a notoriously difficult street grid," Adam Nagourney writes in the New York Times. In fact, the rock's specific route never relied on one path through that "bewildering thicket," but has been constantly updated and changed; as Michael Govan, director of the Los Angeles County Museum of Art, where Heizer's rock will be displayed, points out, "the State of California is always reviewing the state of its bridges and roads. So a route plan that would have worked a couple of days ago doesn't work today." This has the effect of doubling the distance covered: "Door to door," Nagourney writes, "the distance is 60 miles, though the actual drive is going to be closer to 120 miles, as engineers plot a route that can accommodate the huge size of what is known as the Prime Mover, and one that steers clear of low bridges and wires. Any route must have stopover spots to park the rock as it waits for night." The museum's $10 million boulder-displacement project has, of course, faced some public criticism-but Govan has a response for that: "we are putting more people to work here in L.A. than Obama," he quips. This includes "teams of workers... deployed to lift telephone and power lines, swing traffic lights to the side and lay down steel plates on suspect patches of roads or bridges." I remember once reading once about the construction of the Pompidou Center in Paris, which required an elaborate ballet of shutting down whole streets and intersections in the middle of the night, when traffic would already be low, to truck massive girders and beams in past the mansard roofs and streetside cafes of a sleeping city. The building was first a distributed network of large, chaperoned objects, taking shape load by load, before it briefly served as a gleaming sign of the architectural future. In any case, read more at the New York Times. Elsewhere, meanwhile, thieves have dismantled and stolen an entire steel bridge near Pittsburgh. "Pennsylvania State Police are looking for a steel bridge worth an estimated $100,000 that was dismantled and taken from a rural area in Lawrence County," we read. "Police said they believe a torch was used to cut apart the bridge, which measured 50 feet by 20 feet, near Covert's Crossing in North Beaver Township." If you see the bridge-or its parts-moving slowly down a remote Appalachian road somewhere, I'm sure the police would appreciate a heads up. Images by Monica Almeida, courtesy of the The New York Times. This post originally appeared on BLDGBLOG.